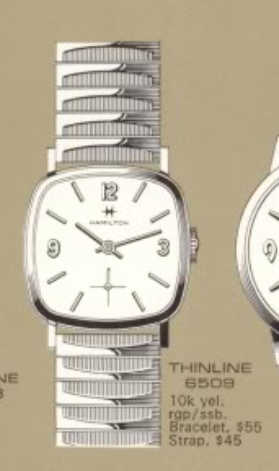 In 1927, Hamilton had 14 watches in it's line up - if you consider solid gold versions to be different than gold filled. By 1968, there were over 185 different models in the line up. Almost 80 of them where "thin" models... Thin-o-matics or Thinlines. One of the last Thinlines to be introduced was the 1968 Thinline 6509. It was produced for only two years. The Thinline 6509 came in a 10K yellow rolled gold plated case with a stainless steel back. It came on a bracelet or a strap. Inside is a 17 jewel 639 movement made by the Swiss maker, Buren - which Hamilton owned at the time. Anytime you see a 639 in a watch, it's a good clue that it's a Thineline model. The movement is very compact. I recently picked up a Thinline 6509 project watch. It arrived in typical, beat up and dirty condition. The stainless steel back lifts off using the lip between the lugs for leverage. The movement is very dirty and some moisture must have gotten inside as there are signs of rust around the mainspring ratchet wheel screw and the set lever screw. It's very important with vintage watches to keep them away from moisture, magnets and situations where they might get dropped. They definitely don't appreciate getting wet. While are the parts are in the ultrasonic being cleaned, I will prep a new crystal for installation. All the parts are cleaned and dried before being reassembled with fresh lubricants. Several different lubricants are called for... the mainspring gets grease, the jewels get varied oil types - depending on purpose, and the setting parts get microgliss grease too. The now-cleaned movement is running vigorously - that's a good sign. But it needs to go onto the timer to really tell how things are running. There are four things to look for on a timer. The first is the two lines that scroll from left to right. They represent how far the balance swings to one side vs the other. That's called the "beat error". The closer together the lines, the smaller the difference between the side-to-side swings. If the timing is spot-on, the lines will be close together and run horizontally. An upward slope means the watch is running fast and a downward slope represents the watch runs slow. The extent of the slope is the severity of ow fast or slow it's running. The numbers across the top are the beat rate error in seconds per day - in this case the watch is running 12 seconds slow per day. The 234 is the amplitude, which is how far it swings side to side in degrees - over 200 is usually the goal. The 8.2ms is the beat error. Ideally this should be zero but a beat error under 1.0 is great, under 3 is okay, over 4 - probably should be addressed. The beat error reflects how well centered the impulse pin (jewel) is relative to the pallet fork. If it's too high, the watch will stop prematurely relative to a watch with a low beat error. The last number of 52 is called the lift angle - it's a setting that is used to calculate the other numbers. Sometimes that position will say 18000, which is the targeted beat rate in beats per hour. 18000 is 5 beats per second (like "one Mississippi, two Mississippi, etc"). Modern watches often have much higher beat rates, even up to 10 beats per second! The beat error of 8.2ms is way too high so that's the first thing I need to address. It's adjusted by moving the position of the impulse jewel, relative to the position of the hairspring stud. Sometimes the hairspring stud is fixed so you have to make the adjustment at the other end of the hair spring... the collet. Fortunately, the 639 has an adjustable hair spring stud location so I can move it gradually and center the impulse jewel by watching the timer. On the shot below, starting in the middle, the lines get closer as they move to the right. As the line passes the right side of the screen, it wraps to the left side and starts over. Eventually the lines get closer together and represent a beat error of 0.5ms. That's a great place to stop. Now I can adjust the beat rate by moving the regulator. The regulator effectively increases or decreases the length of the hairspring - thus slowing or increasing the beat rate accordingly. You can see I moved it the wrong way at the start (the steep downward slope), then over compensated the other direction (with the steep upward slope). It doesn't take much movement to change the rate a lot. I'll stop adjusting with the watch running just a smidge fast. A fresh crystal and strap complete the restoration. The finish on the dial on this Thinline 6509 has been slightly compromised by moisture on the sides so it's not in perfect condition. It's a coin toss whether to get a dial like this redone. An original dial is only original once, so most people prefer a fair original over a nice redial... and redials don't always turn out well. On the other hand, this would be a pretty straightforward dial to redo.